All canceled reservations received 25 or more days prior to arrival are subject to a 10% cancellation penalty. Reservations canceled within 24 days of the scheduled arrival date are subject to a 100% penalty and are responsible for the entire stay and will forfeit all payments. All children 0-2 years old will be considered as an infant and will have a complimentary breakfast. All children 3-9 years old will have a charge of US$10 + taxes (23%) for breakfast and accommodations, rate non-commissionable. Maximum 2 kids per room. In the case that a room has 3 kids ages 3-9 years old, the third will be considered an adult, sharing with two adults. All children 10 years of age or older are considered an additional person. In case of additional reservations for food, all children will pay 50% of the regular price. Lomas del Volcan Hotel is a warm mountain hotel that maintaines its rustic style with wood cabins, each with 2 decks that invite you to enjoy nature. 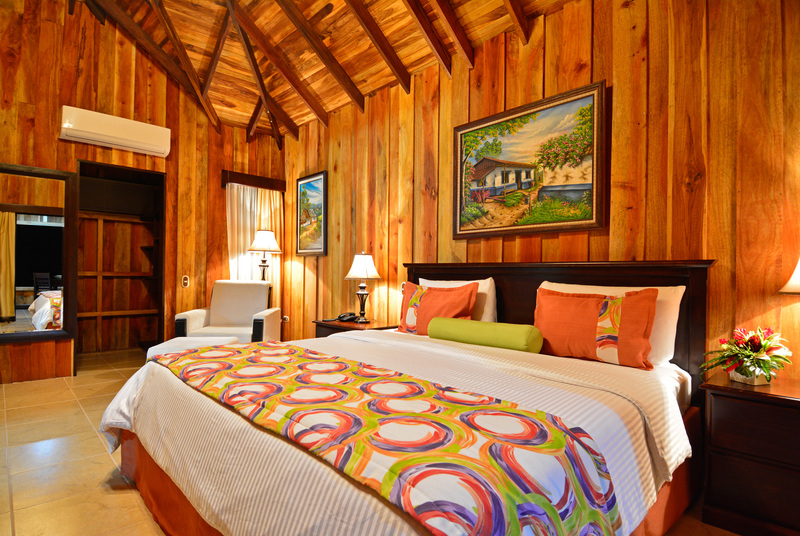 Cabins provide spectacular views of either the Arenal Volcano or the lush tropical forest. The Lomas del Volcan Hotel was founded in the year 2000, atop a hill on a 150 hectares cattle farm. Away from everyday noises and immersed in silence, singing birds may be your only distraction. Having the ability to observe the diversity of plants and animals from the region makes it a special place for nature and eco-toursim lovers. The hotel has 47 cabin-style rooms, spacious parking and wi-fi throughout. It offers a swimming pool, jacuzzi, in-room massage service, local tour sales and a 1.5 km nature trail. There is a restaurant featuring international flare and meeting the expectations of even the most demanding palate. It can serve up to 80 guests at a time. A tropical bar allows you to delight yourself with a cocktail while admiring the amazing view of the Arenal Volcano. Finally, the hotel offers a conference room for 50 people. The terraces of the bungalows were comfortably designed so that you can enjoy a great book with the company of the primary rainforest. You can order room service and enjoy a delicious private dinner at the deck, with a view to the Arenal Volcano. Lomas del Volcan Hotel are proud to maintain the concept that has characterized the Arenal area in terms of rustic cabins and with all the amenities you expect from a city hotel. The Bungalow sleeps up to 4 and the Bungalow Deluxe can accommodate 2 adults. There are no children allowed in the Bungalow Deluxe. The standard rooms consist of 6 rooms build of cement. They have one queen size bed, a refrigerator, hair dryer, cable TV, coffee maker, and a hot water shower. The front porch offers a stunning view of the volcano and the back porch shares a view of the tropical rain forest. What to bring: Cash, bug spray, sunscreen, and hiking boots.